Now to Sunday 9 September; Mummers, Maypoles and Milkmaids. Free exhibition, coinciding with the publication of the book of the same name, bringing together 50 photographs of regional rituals performed throughout the year from Cornwall to Northumberland to mark the changing seasons and celebrate nature's bounty. Location: Horniman Museum, 100 London Road, Forest Hill, London SE23 3PQ. 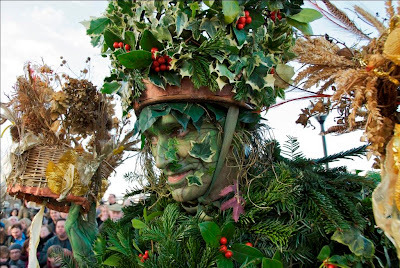 For more details, visit http://www.horniman.ac.uk/ You can read my review of the book here: http://www.badwitch.co.uk/2011/10/review-mummers-maypoles-and-milkmaids.html The photo above is in the exhibition and is copyright Sara Hannant. 50 Middlesex Street, London E1 7EX. Time: 8pm until 10.30pm. Entry on the door: £3/£2 unwaged.